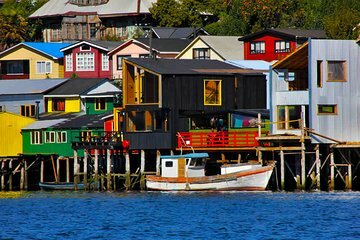 Discover the UNESCO World Heritage Site of Chiloe Island on this full-day tour from Puerto Varas. Cross the Canal de Chacao to reach the isolated island and get a look at the sea lions and various bird varieties. Discover the myths and traditions that surround the island as you explore the cities of Castro and Dalcahue and their respective landmarks. Trip not for us, too far for the day from Varas and did not get a feel for life or culture on the island. Too many churches. It was raining hard so difficult to get a good view of the place. The older generation on the trip seemed to enjoy it. Should have gone white water rafting instead, more fun.